There were a few people interested in my recent university paper on cosplay. It must have scored well, I'm not sure of the final mark (because these aren't given out due to final scaling and other university procedures) but it pulled my marks from a low passing grade to a credit at the end of semester. That means I'm happy enough to share it publicly with those who wanted to have a look. Any feedback would be appreciated, I'm considering doing something similar in more detail for further university work. 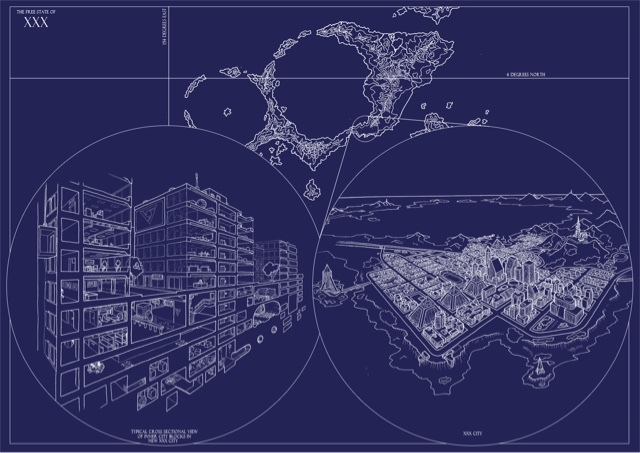 Inspired by the simple, flat, pictorial maps of +Matthew Lowes, I've decided to give all of the towns in the Core FUBAR setting (The Micronesian Free Trade Zone of Mu) a similar treatment. They aren't exactly in the same style that Matthew produces his maps, there are more curves here and the forested areas are depicted in a different fashion. I won't be adding colour to the maps, instead I'll be using different types of shading to display different elements. 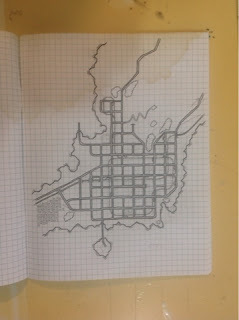 Each of these maps will be transferred across to a blueprint format, like the previous map I displayed for the setting. I'll probably compile these (and the next half dozen or so) onto one or two large format images, with zoom indicators showing where these locations are on the larger island map. In a specific group of islands in the western pacific, among the clusters that make up the nation of Micronesia, there is a very distinct form of currency. I found this out while doing research for the new FUBAR core setting, and thought that it was an awesome idea that could be used for all sorts of story potential. This is called stone money, or Rai, it's most common on Palau. Rai, or stone money (Yapese: raay), are large, circular stone disks carved out of limestone formed from aragonite and calcite crystals. Rai stones were quarried on several of the Micronesian islands, mainly Palau, but briefly on Guam as well, and transported for use as money to the island of Yap. I'm thinking of putting together a half dozen maps for the new FUBAR setting. Maybe getting them printed at A2 size, and presenting them in a leather map-roll tube, or something similar. The aim is to create an "in-world" artefact that might be used for plotting the adventures of the characters as they explore the setting, or plot their revenge on the people who have wronged them. I like the idea of props at the table, and something like this could be a tangible way of ensuring that evryone is on the same page when the story starts to get chaotic. It also helps to show how different parts of the setting are related to one another (especilly if someone decides to set off explosives that destroy a few city blocks, or activates a gas cloud covering a two kilometre radius, or some other crazy deed). The push toward story driven games, where everyone gets a significant input toward the ongoing narrative runs counter to the idea of deprotagonisation. In this style of play, everyone wants their characters to have importance, they want their decisions to matter and they don't want to lose control. The problem with mind control in a story is that it completely strips away the control that a character might have. Characters under such an influence no longer have the capacity to make their own decisions, they operate at the beck and call of the originator of the mind control. I've seen players storm out of games when their characters have been mind controlled, I've seen dice rolls cheated, fudged, ignored, I've seen games collapse. Yet still, mind control spells and effects are a part of many rule systems. So many fantasy maps are drawn in a pseudo fantasy style, so I thought I should draw a map in a more modern style. 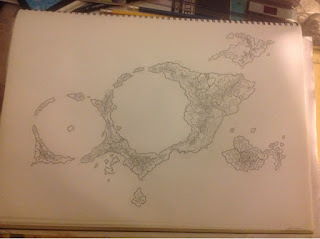 This island map for the FUBAR setting in development has been drawn up in a modern topographic style. So far just the pencilling and inking, next to be scanned in then I'll add a few other elements to it. In a greasy truck stop on the outskirts of town, Mt Norrington is meeting up with his old adversary, the computer hacker who goes by the name of Frog. Some dice are rolled to determine the relationship before Frog walks through the door. It’s a close relationship (6), where neither side has the upper hand (4), and Alice gets to decide how Norrington and Frog are related (5), she decides that she’ll make this interesting. Norrington knew Frog as Susan when they were going out in college, it was a messy break up. A few more sidebar elements to help explain the rules, this time focusing on the types of conflict that might be found in a FUBAR story. Dada Alice makes a comment during the course of play about surveillance cameras turning to watch the moves of the lowlifes, and their actions displayed on nearby TV screens (like in the movies), and Jenny thinks that might make a really interesting addition to the story. Taking inspiration from unexpected sources, then trying to combine them into a narrative that meanders between the real and the surreal is what the game is all about. She jots this down on a note. Since there is a new GM/Oracle in these play examples, I needed to create a new character portrait. So, before we go any further with the play examples, here's Jenny the Oracle. I've been working on some play examples as I rewrite FUBAR. Instead of random scenes that describe rules, I'll be working through an entire sequence of how a FUBAR narrative unfolds. I'll be using most of the same character's that were illustrated for the Walkabout explanatory comic. Gathering a Group Jenny has decided to start a session of FUBAR, she knows a few regular gamers who enjoy action movies, and who might be interested in playing a rules light game where players can drive the action as long as they don’t mind taking a few risks and chaotic story twists. She knows of five players who might be interested: Alice, Ben, Carl, Diana and Ed (she knows this group play well together because they played a few “Walkabout” sessions together recently). This guy is most certainly a travelling minstrel or troubadour from the post apocalyptic world of Walkabout, keeping the classics alive with his steam driven box of wonders. The FUBAR rewrite - What is Difficulty? Plenty of games have variable difficulty tasks, with different degrees of character skill to accommodate varying levels of ability. FUBAR has always had the idea of characters rolling three dice in things they aren't particularly competent at, four dice if they have some level of skill, and five dice if they are well practiced in the types of actions necessary to complete a task. In the core game, a success was a success, a failure was a failure. Not quite a simple binary, because the fail option is split into "fail, but you can try again", and "complete fail with no chance of a retry". There's the chance of suffering a sacrifice every time a task is attempted as well...so a chance of a retry also means a chance the more needs to be sacrificed to complete an action. In my FUBAR rewrite I've decided that I need a default setting for the game. It was always intended to be a bit cyberpunk, and since we now live in the era that was once considered the edge of the cyberpunk timeframe, the game will be somewhere between our world and the worlds depicted in Shadowrun or Cyberpunk 2020. A bit like the way White Wolf's World of Darkness was an "urban gothic/fantasy", this setting will be "urban sci-fi". 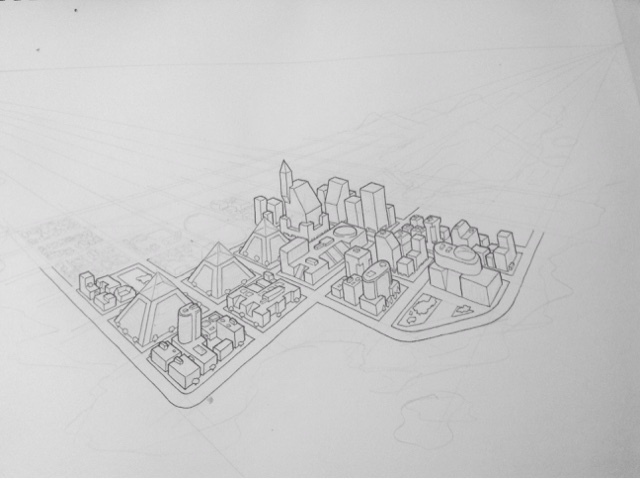 So I've started drawing a map of a city that could have been, maybe somewhere on a Pacific island, where there is a space port to take advantage of the equatorial spin. Maybe this location is a corporate tax haven, like a Micronesian equivalent of Dubai, drawing on trade influence with Asia, the Americas, Australiasia, and within flight distance of India. The FUBAR rewrite - Sometimes it's OK to say "No"
"Say Yes, or roll the dice"
As I've been working through my FUBAR rewrite, I realised that there are some times when it's fine to flat out say "No". But that response needs to be justified. I've been laying things out with charts, and reflecting on the various times this game has been played. As I said, in FUBAR traits reflect what advantages and disadvantages apply to a character as they attempt to complete tasks on the way to their intended goals (whatever that goal may be). Static traits are the standard repertoire of choices that might be used in these situations. Therefore they specifically give a flavour to the inherent types of stories that might be told. Too many injury and conflict based traits would imply a game where these things are important, and thus push the narrative toward combat and physical danger. The same sort of thing is implied in a game where there are numerous guns and weapon descriptions. Sure you can play a deeply emotional game in the world of Cyberpunk 2020, or even RIFTS, but the game just isn't really set up for that style of story. 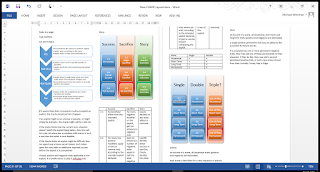 I liked where I was going with System 4, using definitive verbs to replace skills. In this set up, you say "I run over there", "I drive the car", "I intimidate the thug". If skills have been replaced by action verbs, then Traits add adjectives to characters. "I'm prepared, and I craft the device", "Although I'm injured, I tumble out of the way". Traits might be linked to items, or they might be linked to people. traits can be linked to anything as a way to make it easier or harder to perform actions. But now I'm looking at what those traits are. Obviously in a game where combat might arise, or where physical stunts might occur, then it's possible to become injured. On the flip side, it might be possible to pumped-up (or some similar phrase) to indicate readiness for physical action/conflict. FUBAR works simply, you roll three (or more) dice and allocate the results between categories of Success, Sacrifice and Story. If you have advantages, any positive success results are magnified. If you have disadvantages, any negative results are magnified. Positive success results manifest new advantages (or eliminate disadvantages), negative sacrifice results manifest new disadvantages (or eliminate advantages). Feedback loops develop as positives beget positives and negatives beget negatives. The results allocated to the story category, allow the player or the GM to define the way these feedback loops play out. I don't have a computer that could handle the graphics of Fallout 4. I'd actually be interested in playing it, it seems like it might be the kind of game that I'd enjoy, but I'm not running out to buy a new computer and paying first release prices just to be one of the "in-crowd"...sorry. 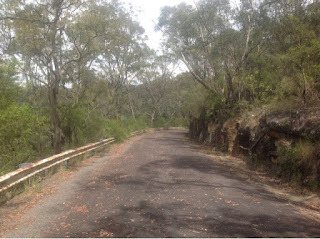 Luckily I live near some abandoned industrial sites and other suitably post apocalyptic looking areas to explore. These are certain to be added to the Walkabout inspiration files. The RPG design community has just come off a run of great contests and is now immersed in NaGaDeMon. I'm not saying that every designer participated in every contest, or that every designer is now struggling through NaGaDeMon to polish up a game, but there were heaps of designers involved in Game Chef, then ThreeForged, then Golden Cobra, and now I'm seeing plenty of people displaying their working processes in NaGaDeMon. Each of these formats is doing something different, each is pushing the envelope in specific ways, and throughout the year other contests pop up now and again each catering to a specific niche of design. I love seeing what other people are producing, the interesting direction that they are trying to push the collective of hobbies that we refer to as "gaming". I also love seeing different people processes at work in the different ways through these exercises. Use a deck of cards, flesh out NPCs and characters in a sultry diesel noir setting on the edge of sanity and the occult, driven by the lyrics or Tom Waits, a few too many whiskeys, and some crossroads blues. 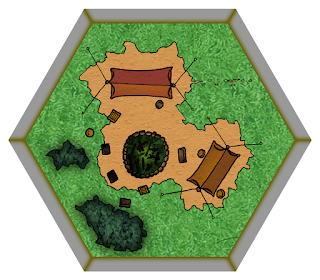 Here's the starting tile for Bug Hunt, a little encampment in the middle of the wetlands. Now that I've completely compiled the image, I don't mind it too much. It could probably do with some more work, maybe some shading across the grass, but I don't want it to look too busy. Today I'm working through the illustration of 30 map tiles for "Bug Hunt", that will be 24 hex tiles for the core set to explore, a home base, and an extra five tiles for an expansion if anyone is interested in it. The 30 tiles have been scanned in and now I'm colouring them. Applying grassy, sandy, rocky, watery textures, and generally trying to make the tiles look a bit more professional than most of the games I've seen produced by folks on The Game Crafter. I'm also trying to make sure the cards match the stylistic elements I've already got going with the bug cards. I'm not particularly happy with whatI've generated up so far, so I might start the process of recolouring them all over again. That means there won't be a lot of work here on the blog, because if anything else gets focus it will be the FUBAR rewrite. I might post some pictures of the cards shortly to crowdsource some feedback. East of the mountains, west of a vast jungle, north of a vast wasteland, lies a city.In the heat of the day a mist rises from the jungle obscuring the sun with mist and clouds, sometimes at night a breeze blows away the cover and the moon shines through, but every morning brings new humidity, new mist. The sky is eternally grey, while the humidity brings rust and corrosion to the metal. The people haven't seen the sun in years. It's a world like our own, maybe a parallel universe, but its a world where the shadows are a bit longer, the streets a bit grittier and the nothing is quite what it seems. Rust City is a world where you ain't nobody 'til you've cut a deal with "Old Scratch", where everyone's got a cover...maybe as a muttering short order cook, an ivory tinkling bluesman, a sultry singer, a gutter tramp, or maybe a carney on the run from a past that's rapidly chasing them down.